We offer a wide range of liquid syrups in the 200ml packing.Our Calcium Syrup& Vitamin D3 Syrup comes in new and enriched Mango Flavour by the name Calsill. 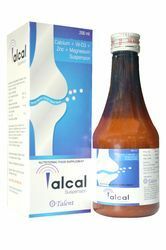 Calsill is known to deliver the best in class results for treating deficiency of Calcium & Vitamin D3. calcium , magnesium, zinc gluconate , vitamin D3 suspension. Being an eminent organization in the industry, we are involved in manufacturing a premium quality range of Calcium C Vitamin D3 Suspension. With the help of diligent & deft professionals, we have been able in manufacturing and supplying our valued clients an excellent array of Tricalcium Suspension. 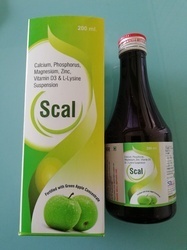 Calcium Carbonate, Vitamin D3 and Zinc Suspension. Vitamin D3 (Stabilized) ................... 400 I.U. We are manufacturer of Calcium Zinc Syrup as per below specification. Enriched with years of experience in the industry, we are engaged in offering Zincavit D3 Suspension. We have achieved widespread recognition in offering Calbit Suspension to the clients. Calbit Suspension is made at vendors' end by utilizing the top grade ingredients as per the medical standard. Offered range is tested on various quality factors to maintain the quality and purity. This product is widely demanded in the market.